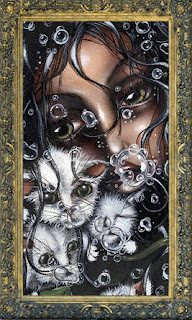 Once all the wedding hoopla died down, a kind of calm came over me - and I broke down and purchased a couple of wonderful prints of my favorite local(ish) artist, named Angelina Wrona. 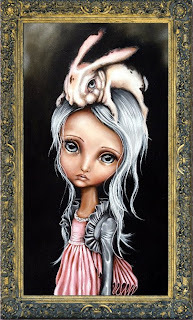 If you are into doe-eyed, "Precious Moments" style characters with a darker twist, you might want to take a gander at this Canadian artist from Merrickville, Ontario. My husband calls me "Bunny" so we thought the crazy huge picture (print) of a girl with a rabbit on her head (see right) would be perfect for us. We also bought two smaller prints; "Clarice" - based on the character from "Silence of the Lambs" we think ... and "Bridesmaid" – a fitting memory of our wedding. This painting has a quite distinctly different style than her other ones, which is nice … changing it up a bit. this picture (see right) would be more than perfect for us. Although these are authentic, I wanted a picture that was signed and numbered out of 100, so I contacted Angelina's husband and my parents decided to get me a Petite version of "Redemption" for my birthday. Hey thanks for writing about the silence of the lambs reference. It took several months for it's connecion to dawn on me but I find it fascinating. Probably because that was such a pinnacle scene in the film and her interpretation is absolutley captivating. Glad you love her work as much as I do! Thanks for writing about it too! I just read this! I am so sorry for not writing on this comment earlier! It was the first thing that came to mind and it is perfect! 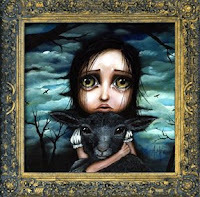 Angelina Wrona is a wonderful painter, and I am so happy you like her too! :D I actually got one of her new prints called "Visionary" for Christmas and I love it so much!